The Vargo TiFusion Gem shirt has 95% polyester and 5% nylon fabric that provides a 4-way stretch for comfort and is a wicking synthetic for breathability. Note that the website says that it is 100% polyester but the tag states differently as noted above. 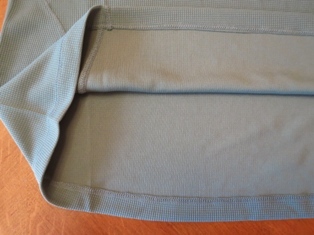 Under the arms and down the sides is a different lighter weave that is for breathability and wicking. There is also a patch of this same fabric on the upper back and a small triangle on the upper front. 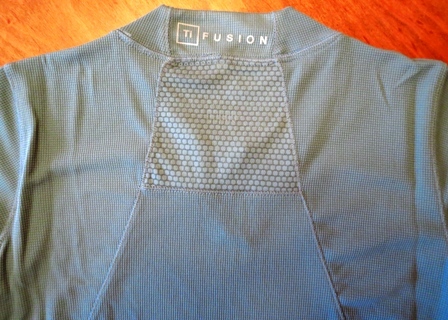 The fabric is infused with titanium for odor resistance. The label claims that the titanium also allows the shirt to dry faster, improves UV protection and has the power to clean itself. It claims that the hydrophilic properties of the shirt will attract and disperse moisture and that moisture will in turn disperse dirt and oil while electrostatically removing bacteria. Now that's the type of clothing that I want, something that will do my laundry for me. The style is a trim athletic fit with a longer hem and the back hem being even a little longer than the front to cover hips and backside. The neck style is described as a scoop but it is more of a crew neck to me with a wide collar that stands up a little especially in the back. 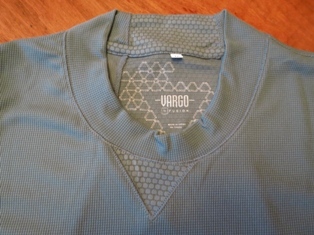 The 'V' for Vargo logo over the chest and the 'Ti Fusion' logo on the back of the collar are both printed in a reflective ink for nighttime visibility. My initial impression was how substantial this shirt seemed when it arrived. It looked larger than I expected and had a heavy-looking texture to the fabric. I tried it on over the shirt that I was wearing and it fit fine. So it is a little larger than my typical medium-sized shirts but it fits comfortably. It has a women's cut but fits loosely on me as compared to most of my athletic shirts that are more form-fitting. The fabric has an interesting waffle pattern to it except for under the arms which has a beehive pattern panel which extends down the sides of the shirt. I can't see any signs of titanium such as metallic threads or silver specks; the fabric is a solid color. The inside surface of the shirt is completely smooth in contrast to the textured outer surface. Although the shirt is as it appears on the website, describing the neck as a scoop is surprising to me. It seems just like a crew neck to me. I'm happy about this because I don't find scoop-neck shirts to be functional in the outdoors due to exposure to sun and insects. Washing instructions are to wash in cold water and tumble dry low. No bleach, iron, dry clean or fabric softeners are to be used. The Vargo Outdoors TiFusion Gem Short Sleeve Shirt is a technically engineered basic piece of clothing. I can't wait to try it in the field to check out all of the claims. I wore the Gem for various activities during the test period. I wore the shirt for one overnight backpack trip, a 3-day boat camping trip, two hikes, seven morning runs, four softball games and three trips to the gym. I'm calling this my Jekyll and Hyde shirt since I had completely different results with it depending on the outside temperatures. When the test period started it was particularly hot with high temperatures well over 90 F (32 C). On those days, the Gem just seemed miserably heavyweight and hot. I am usually accused of not sweating although I do sweat on hot days and when working hard. However, while wearing the Gem, I noticed myself sweating much more than usual. On the first hike where I wore it, I didn't wear any daypack so my back shouldn't have been very sweaty. But when I got back in the car I could feel the sweat on my back against the seat of the truck. Weird. I wore it for evening softball games during the hot period and found that I could really feel the heat and was sweating more than usual. I have to admit that I could also feel the breathability and air movement through the shirt as I ran which seemed to cool me. However, in general, with the heavier weight of the fabric and tendency to make me sweat more than usual, I did not prefer to wear this shirt on hot days. During this time, I also found that the shirt smelled bad after just an hour of exertion and I had no desire to put it on again until it was laundered. Later in the test period, the weather cooled to high temperatures in the 70s and 80s F (20s C). During this time, I had completely different results with the shirt. I wore it for pre-dawn running in temperatures around 60 F (15 C) and it was very comfortable. I wore it to the gym which is air-conditioned. I wore it to evening softball games in temperatures in the 70s (low 20s C). And I wore it to hike, backpack and boat camp. On the backpacking trip, it got very hot in an exposed burned area in full sun where I could feel a lot of sweat but I cooled quickly and the back of the shirt dried quickly when we took a break in the shade. On the boat camping trip, I wore the shirt for three days straight including sleeping in it at night. I know, eww, but it's all for a good test. The shirt was stinky but not bad after all of that time. In these conditions I was able to wear the shirt on up to five different occasions without washing it. There was a slight odor after use but it seemed to 'go good' between wearings and I'd don it again. The bacon collar that I saw when the shirt was new did not go away after washing as I had expected. There was always a wrinkling of the collar that looked unpolished. The durability of the shirt has been great. Despite 23 wearings to date and 9 washings, the shirt looks very much like it was when new. There haven't been any noticeable wear areas from pack straps, no pulled threads from getting caught on brush and no pilling. With the much cooler temperatures I didn't have the opportunity to wear the Gem as often as in the prior test period. I found myself preferring a long-sleeved shirt or base layer instead. But I wore the Vargo Gem shirt for one five-day backpacking trip, two hikes, one snowshoe hike, two morning runs and a softball game. 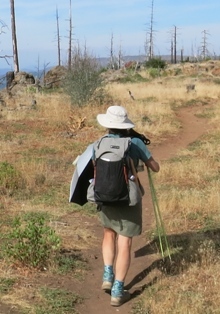 Pacific Crest Trail, Cascade Range, Northern California: 5 days; 65 mi (105 km); 4,355 to 6,684 ft (1,327 to 2,037 m) elevation; 31 to 64 F (-0.5 to 18 C). Conditions ranged from clear and sunny to cloudy with strong winds and light rain. Snowshoe hiking in Sierra Nevada Foothills, California: 2.5 mi (4 km); 5,873 to 5,923 ft (1,790 to 1,805 m); 32 F (0 C); first good snowfall; windy with storm coming in. I continue to like how the shirt performs in cooler temperatures. The fabric is comfortable and has enough stretch to accommodate even the most strenuous activity. It still resists odor very well. On the five-day backpacking trip I noticed some smell after the first day of hiking but continued to wear it every day and even to bed one night to be ready for a pre-dawn start the next day. The shirt didn't seem to get any more stinky and if anything seemed to mellow out as the trip went on. After washing, the shirt has no residual odor like some synthetics which seem to never come fully clean again. 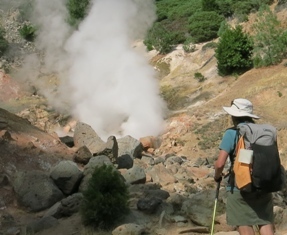 While the high temperatures on the backpacking trip didn't even hit 70 F (21 C) we did have some hot exposed climbing through a burn area that was quite sweaty. The shirt performed great by breathing well and dried out quickly when we stopped for a snack at the top. The breathability has been very good. After another ten uses and five more washings, the shirt still looks great. There are no wear spots, no abrasions, no pilling and no pulled threads. This is amazing given how much time it spent with a pack rubbing on it or getting snagged on underbrush. I'm impressed with the durability. Overall I've really come to like this shirt and will continue to wear it in the Spring and Fall when short-sleeved shirts are comfortable but probably not in the Summer when temperatures call for the lightest clothing. The Vargo Outdoors TiFusion Gem Short Sleeve Shirt is a technically engineered basic piece of clothing. I didn't have great results in hotter temperatures, but loved it when it cooled a bit. This concludes my Long-Term Test Report and this test series. 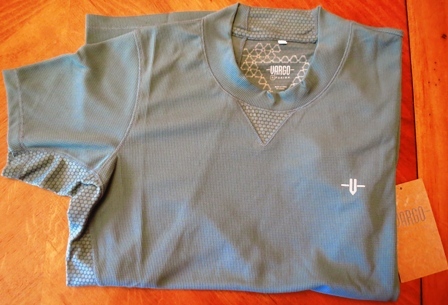 Thanks to Vargo Outdoors and BackpackGearTest.org for the opportunity to test this bullet-proof shirt.